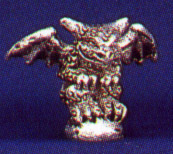 With a fiendish grin and outspread wings our tiny gargoyle squats, resting his front paws on his knees. This sculpture is perfect for anyone who likes to fiddle with something in their hands. The back of this sculpture is smooth and dished in, and wonderful to feel.